Lipo 6 Black Hers: The End of the Line Extreme Female Fat Destroyer! There are many female fat loss products all claiming to be EXTREME. Now with the category saturated with so called extreme formulas, Nutrex takes fat burning to another level. Beyond extreme, beyond maximum strength, way beyond any fat-burning experience you have ever had, we bring you LIPO 6 BLACK Hers. LIPO 6 BLACK Hers is the meanest, strongest and most extreme fat burner this planet has ever seen. We've created the most potent blend of fat-destroying compounds imaginable. No, that doesn't mean watered down like other female formulas. This powerful supplement is operating in a territory no female fat burner has ever dared to go. LIPO 6 BLACK Hers is engineered to attack body fat with a killer instinct, instantly destroying it on contact. Make no mistake about it LIPO 6 BLACK Hers is a dead serious fat burner. In fact, LIPO 6 BLACK Hers is so potent we needed extra insurance just to sell it! If you have reached a plateau with your current fat burner and are looking for something to truly rejuvenate your fat burning regimen, you are a great candidate for LIPO 6 BLACK Hers. 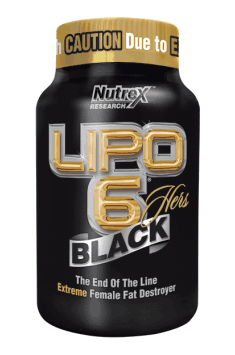 LIPO 6 BLACK Hers is the one female fat burner that dares to go further. It packs the type of ingredients that are so incredibly effective at burning body fat that it is not for the weak-hearted or undedicated! If you are looking for a fat burner that works as hard as you do, LIPO 6 BLACK Hers will quickly get you the results you are seeking. One portion (3 capsules) after breakfast, the second portion (3 capsules), 30-60 minutes before workout. One portion (3 capsules) after breakfast. During the application it is worth to take care about higher liquid supply. For best effects it should be used from 6 to 8 weeks, preferably on an empty stomach. Glycerin, Vegetable Celulose (Vegetable Capsule), Purified Water, Polysorbate 80, Hypromellose q.s.p., FD&C Blue 1, FD&C Red 40, FD&C Yellow 6.